Marcellina Pizza Restaurant Henley Beach uses their own specialised couriers to deliver their food. Tomato, ham, cheese & pineapple.Large Pizza (12 inches only),Gluten Free Pizza (12 inches only). Tomato, cheese, fresh tomato, fresh basil & oregano.Large Pizza (12 inches only),Gluten Free Pizza (12 inches only). Tomato, cheese, salami, mushroom, capsicum, anchovies & kalamatta olives.Large Pizza (12 inches only),Gluten Free Pizza (12 inches only). Tomato, parmesan cheese, mushroom, capsicum, onion, kalamatta olives, fresh tomato & herbs.Large Pizza (12 inches only),Gluten Free Pizza (12 inches only). Tomato, cheese, mushroom, capsicum, pineapple, onion & kalamatta olives.Large Pizza (12 inches only),Gluten Free Pizza (12 inches only). Tomato, cheese, ham, capsicum, mushroom, kalamata olives, anchovies.Large Pizza (12 inches only),Gluten Free Pizza (12 inches only). Tomato, cheese, salami, capsicum, onion, kalamatta olives & hot chilli.Large Pizza (12 inches only),Gluten Free Pizza (12 inches only). Tomato, cheese, ham, mild salami & bacon rashers.Large Pizza (12 inches only),Gluten Free Pizza (12 inches only). Tomato, cheese, mild salami.Large Pizza (12 inches only),Gluten Free Pizza (12 inches only). Tomato, cheese, mild salami, fresh tomato & kalamatta olives.Large Pizza (12 inches only),Gluten Free Pizza (12 inches only). Tomato, cheese, garlic, parsley & prawns.Large Pizza (12 inches only),Gluten Free Pizza (12 inches only). Tomato, cheese, chicken fillet, barbecue sauce, mushroom & onion.Large Pizza (12 inches only),Gluten Free Pizza (12 inches only). Tomato, cheese, chicken fillets, onion, capsicum, olives, garlic & herbs.Large Pizza (12 inches only),Gluten Free Pizza (12 inches only). Tomato, cheese, chicken fillets & pineapple.Large Pizza (12 inches only),Gluten Free Pizza (12 inches only).Large Pizza (12 inches only),Gluten Free Pizza (12 inches only). Tomato, cheese, prawns, smoked oysters & anchovies.Large Pizza (12 inches only),Gluten Free Pizza (12 inches only). Tomato, cheese, ham, mild salami, mushrooms, onions, capsicum, pineapple & kalamatta olives.Large Pizza (12 inches only),Gluten Free Pizza (12 inches only). Cheese, ham, mushroom, capsicum, mild salami & kalamatta olives served with traditional bolognese sauce.Large Pizza (12 inches only),Gluten Free Pizza (12 inches only). Tomato, mozzarella cheese, bocconcinni cheese, fetta & parmesan cheese.Large Pizza (12 inches only),Gluten Free Pizza (12 inches only). Minced lamb, middle eastern seasoning, fresh tomato, shallots, lemon, parsley on a freshly rolled pastry.Large Pizza (12 inches only),Gluten Free Pizza (12 inches only). Tomato, mozzarella cheese, tuna, onions, artichoke.Large Pizza (12 inches only),Gluten Free Pizza (12 inches only). Bacon, onion, roasted capsicum, kalamata olives, chicken fillets, barbecue sauce and mozzarella cheese.Large Pizza (12 inches only),Gluten Free Pizza (12 inches only). Tomato, mozzarella cheese, salami, roasted capsicum, artichoke, fresh tomato, fetta cheese & kalamata olives.Large Pizza (12 inches only),Gluten Free Pizza (12 inches only). Tomato, mozzarella cheese, salami, onion, mushroom, grilled eggplant, spinach & bocconcini cheese.Large Pizza (12 inches only),Gluten Free Pizza (12 inches only). Tomato, mozzarella cheese, prosciutto crudo, roasted capsicum, fresh tomato, salami, kalamatta olives.Large Pizza (12 inches only),Gluten Free Pizza (12 inches only). 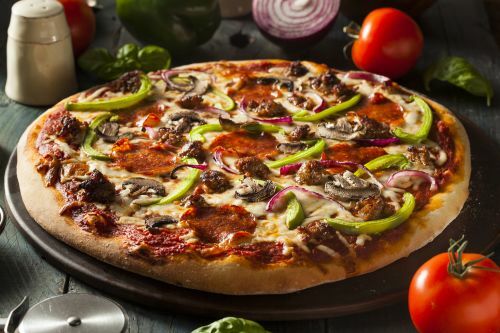 Freshly rolled pizza with mozzarella cheese, spanish onion, marinated beef fillet and fresh mushrooms.Large Pizza (12 inches only),Gluten Free Pizza (12 inches only). Mozzarella cheese, fresh tomato, red onion, marinated beef strips, prawns & a drizzle of Dijon sauce.Large Pizza (12 inches only),Gluten Free Pizza (12 inches only). Our famous marinara seafood mix with garlic, parsley & mozzarella cheese.Large Pizza (12 inches only),Gluten Free Pizza (12 inches only).